Holy Communion is a sacrament and a means of Grace. Like baptism, United Methodists regard Holy Communion as a sacrament. That is, it’s an act of worship ordained by Christ and is a means of grace. This does not mean that we become any more worthy of God’s grace by taking part in Communion. Rather, we open ourselves to the divine love that’s already there; we become more ready to receive that love and to respond to it. 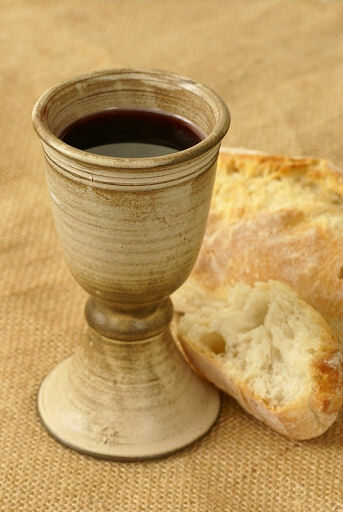 As with baptism, we use common, physical gifts of the earth, bread and wine—though in United Methodist churches we prefer unfermented grape juice. Communion is served on the first and third weekends of the month in our Saturday night and Sunday morning service and is served weekly at our Sunday Evening Celebration Worship. Everyone is welcome at our table. Holy Communion is a family meal, and everyone is a child of God. Parents decide at what age their children will receive this sacrament. But children of any age are welcome! Holy Communion (also called the Lord’s Supper or the Eucharist) is a mystery too deep for words. Its meaning will vary for each of us and from one time to another. But three essential meanings are caught up in this proclamation in our Communion service: “Christ has died; Christ is risen; Christ will come again” (The United Methodist Hymnal, p. 14). Communion is not a memorial service for a dead Jesus. It’s not a time to wallow in our own guilt. It’s a time to celebrate the Resurrection, to recognize and give thanks for the Risen Christ. — Adapted from The United Methodist Member’s Handbook, Revised and Expanded by George E. Koehler (Discipleship Resources, 2006). The Sacrament of the Lord’s Supper will be offered in a group setting to members and friends of Grace Church and any others who wish to commune on the Second Tuesday of the month, at 1:00pm. Communion will be served in the room off the main hall near the receptionist’s desk. If you have any questions about this expanded communion ministry, please contact Pastor Jim Shirbroun at the church 712-276-3452.